At some point, most everyone feels deflated, unmotivated, lazy, or negative in life. Some may pinpoint this as laziness but it’s not so. It can be attributed to a feeling of mental exhaustion leading to mental burnout or the feeling of being unfulfilled and dissatisfied with where you are and where your life is heading. You can be sitting in the office at work or at home, staring into your computer screen and not wanting to do anything. A million thoughts could be running in your mind, many of them concerning your aspirations and dreams and goals and feeling upset that you didn’t achieve what you wanted to. You feel defeated and deflated and don’t see anything good up ahead. If you’re feeling this way or tend to get these episodes of resentment and anxiety, you are not alone. It’s actually very common in the world. Millions of people are extremely bored and unmotivated and just can’t seem to sum up the energy or mental boost to get them going and move forward with enthusiasm. In this guide, you’re going to learn how to completely tank up your engine with fuel and light it on fire with passion and a renewed energy and confidence. Lack of passion and feeling unmotivated is a mindset. What you feel in terms of dissatisfaction is completely in your mind which you need to eliminate entirely. You’ll discover how people in your exact same position went on to boost their motivation and drive themselves forward towards reaching their goals. 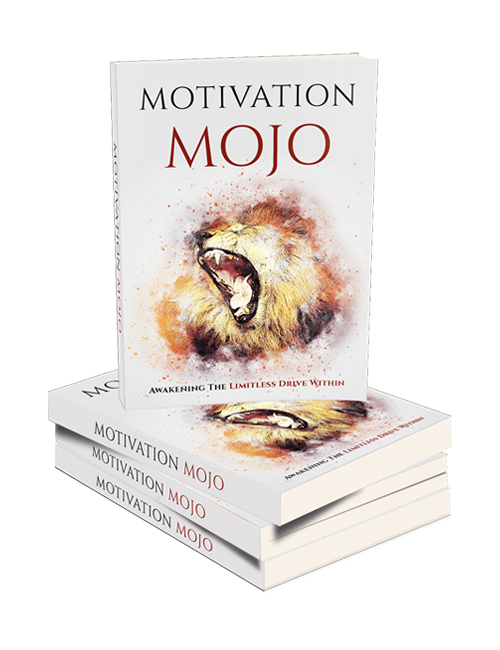 You’ll also discover the true power of motivation, how to get back your mojo when you’re feeling deflated, ways to snap out of your funk, how to rebound when things go wrong, how to keep your fire burning and much much more. You can also get the visual experience with this guide in the Motivation Mojo video course. Grab it all now.